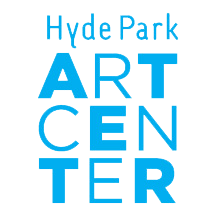 Hyde Park Art Center has been a leader in advancing contemporary visual art in Chicago since 1939. With an expansive reach and bold personality, the nonprofit organization brings artists and communities together to support creativity at every level. As an open forum for exploring the artistic process, the Art Center fosters creativity through making, learning about, seeing, and discussing art—all under one roof. By developing socially adept programming that finds new ways to engage diverse audiences in the work of Chicago’s artists, the Art Center makes space for transparent interaction with art and the artistic process, inspiring creative exploration and encouraging exchange between audiences and artists. Within its facility, the Art Center inspires creativity through dynamic art-centered interactions, including exhibitions, artist talks, free public events, studio art classes, professional development opportunities for artists, arts education outreach, and an international residency. These programs work in concert to cultivate a more vibrant, inclusive arts community; facilitate opportunities for artists to experiment and take risks with their work; and encourages visitors to get involved with the entire process of art and art making. Outside its walls, the Art Center’s outreach programs in historically underserved neighborhoods bring the visual arts to Chicago youth, their teachers, and their families.